The unannounced Motorola Bounce that we showed you yesterday will reportedly be launched as the Moto X Force - a name that makes more sense, since the Moto X brand is pretty well known around the world. The handset's new name was revealed by @upleaks, which also posted another render of the device, this time showing a black variant of it (after yesterday's white version). As previously reported, the Moto X Force / Bounce is expected to be a high-end smartphone with a "shatterproof" display - we're not exactly sure how this shatterproofness is achieved. Anyway, the screen should be a 5.4-inch one with 1440 x 2560 pixels (Quad HD), thus offering a higher ppi density than the 5.7-inch Quad HD screen of the Moto X Style / X Pure Edition. It's said that the Moto X Force is powered by an octa-core Snapdragon 810 processor, while other features should include a 5 MP front-facing camera, a 21 MP rear camera, 3 GB of RAM, 32 GB or 64 GB of storage space, and a generous 3760 mAh battery. Motorola may plan to launch the Moto X Force in December. Pricing details are not yet available. 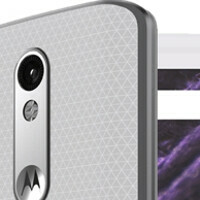 What do you think of this upcoming Moto handset thus far? What's going on with the bottom speaker? In these renders it looks like 2 grills on the bottom of the device, can anyone confirm if this phone has dual front facing speakers? I concur with you though, this is a much more sensible phone than what's coming out today in terms of size and specs, still wish you would've gone with a 5.2" 1080 display though. I have a strong suspicion this Moto X Force is the international variant of the upcoming Droid Turbo 2. It's the only logical reason this phone would exist so close to the release of the Moto X Style/Pure. I'm about 95% sure this is the Turbo 2. (Droid Force? Why not?) The Moto X Pure is called just that because it's the One Moto X to Rule America. Sapphire isn't impact resistant, it's probably worse than Gorilla Glass in terms of shatter resistance. Sapphire is the most scratch resistant glass only, shatter is a whole new ball game. That's actually correct (as in: sapphire isn't really shatterproof). Article updated, thanks! I think it might be a flexible display or a softer type diplay. Maybe its a high quality resistive or resistive/capacitive hybrid. Seiko's solution for their sort of pro dive watches is their own glass creation called hard lex. They since made a hardlex with a sapphire infused coating. Sounds pricey though so I am guessing this is plastic like the Lg gwatch or a softer version of the S6 edge plastic display. The S6 active is apparently quite good. Michael fisher from picket now was literally tossing it around in his review. I hope this get a US release. Also, is the back of the black version actually textured? I like it! The white looks like a printed pattern though. That's really awesome, just wish it had the 820 and maybe fingerprint. It's perfect otherwise, size, resolution, camera, battery, shape, nice. I have to assume that it has a plastic screen instead of glass. Kind of hard to put an unreleased chip in the phone. I'm not expecting 820 devices until next spring. They haven't even fully announced that SoC, it's still in the slow drip hype & leak phase. So many awesome devices coming up !Gold and glass Note 5 of mine still feels amazing though :p Only missing the IR blaster a lot !! the ultimate of motor x's this year; the father of the series. .. I've been giving it a lot of thought, and if this ends up being another carrier unbranded phone that works on all major US networks like the Moto X Pure then I'll end up buying this phone. The higher capacity battery, additional processor cores, and probable faster RAM is just too tempting. God, I'm going to be so disappointed if it's a Droid.